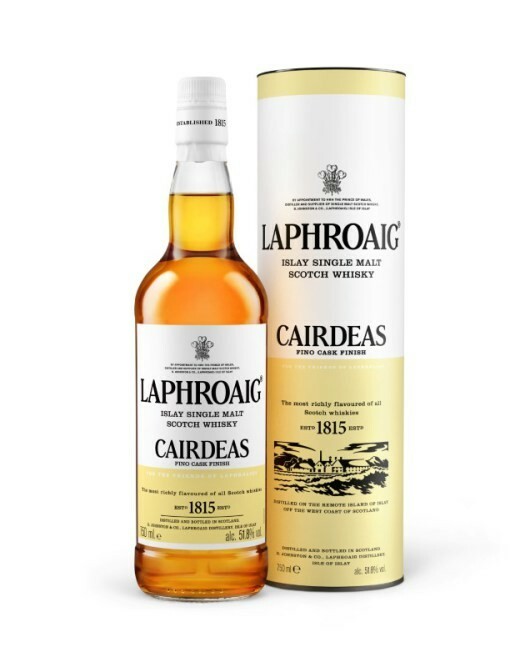 Get excited for the unveiling of Laphroaig’s annual Cairdeas expression for 2018 ~ Laphroaig Cairdeas Fino Cask. Crafted in limited quantities and in the spirit of friendship Cairdeas Fino Cask is perfect to share with friends old and new, while of course, keeping a bottle or two for yourself! Each year, Laphroaig distillery manager, John Campbell, crafts a new version of Cairdeas to celebrate friendship (“Cairdeas” means friendship in Gaelic), and to honor the nearly 700k loyal members of the Friends of Laphroaig community. Laid to rest in the distillery’s Warehouse 8 and 10 and hitting shelves this month, Cairdeas Fino Cask (SRP: $79.99) features a special double maturation of the liquid in first fill bourbon barrels and then finished in Fino Sherry casks. The result: a full-bodied, peaty whiskey that’s unmistakably Laphroaig.